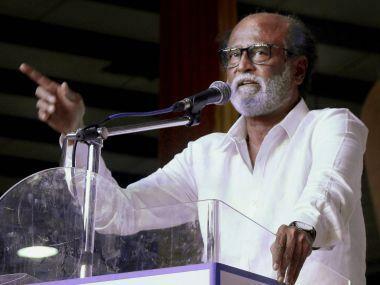 Guwahati: Superstar Rajinikanth would be the first choice for the role of King Lear if Vishal Bhardwaj decides to make a fourth film on Shakespeare's tragedies. Bhardwaj has successfully adapted Shakespeare's Macbeth, Othello and Hamlet into Maqbool, Omkara and Haider. "Before making Haider, I had worked on the script of King Lear and visualised Rajinikanth in the lead role. He will be my first choice, if and when I decide to make the film," Bhardwaj said at the just concluded Brahmaputra Valley Film Festival in Guwahati. Asked why he chose Shakespeare's tragedies to make his signature films, the filmmaker said that while Maqbool was an accident, the other two films were his attempt to complete the trilogy. "...for my second film, I was looking for a story when I decided to make Omkara, an adaptation of Othello, and finally there was a pressure to make the third of the trilogy." "Haider, the third in the trilogy, was a very difficult film for me. I was under pressure to ensure that the film matches up to the first two films and at the same time, I wanted to make a film in Kashmir against the backdrop of conflict," he said. Next on Bhardwaj's wishlist is a trilogy of Shakespeare's comedies but there is nothing on the horizon as of now. "I will not direct any films but will compose music for three films. I, along with many of my well wishers, feel that I have neglected my role as a music composer and for the next year, I am going to concentrate on music." Asked whether the legacy of filmmakers like Satyajit Ray was now lost, Bhardwaj said that was not true as a generation of filmmakers have emerged watching his films and "many different kinds of films are being made". He further appealed to the maestro's son Sandip Ray to part with the rights of filmmaker's works so that others can make films on his stories. "Ray was a master story-teller and many of his stories can be made into great films," he added. The director, who made his debut with the children's film Makdee and went on to make The Blue Umbrella, regretted that hardly any films were being made exclusively for children. "There is hardly any creative effort on the part of adults to make films for children and even films made by the Children's Film Society of India (CFSI) are not commercially viable. This must change and we as members of the society must ensure that more such films are made and children get to see these in cinema halls," he said.